Happy Monday friends! I hope everyone had a fantastic weekend. I had a good mix of relaxing and hanging out with friends and since I didn't care too much about who won the Super Bowl, I'm not crazy exhausted today. But just because I didn't care who won the Super Bowl doesn't mean I wasn't all about the food! 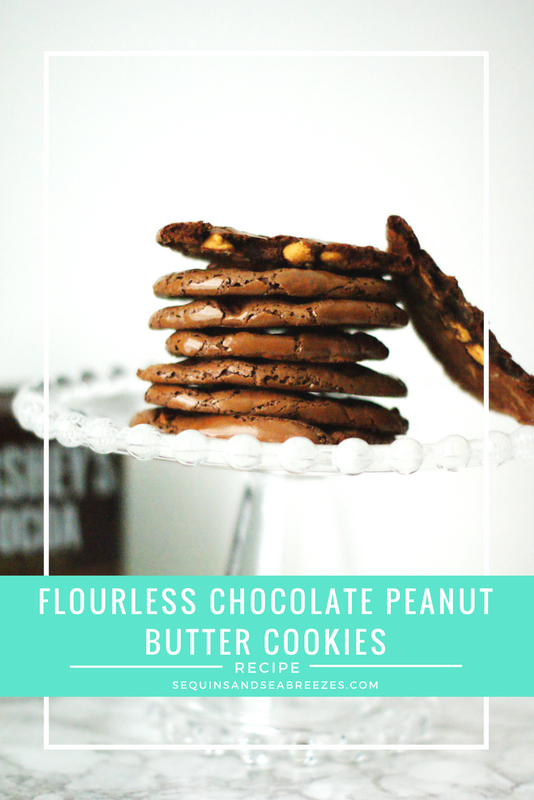 Saturday night I got to have a game night with Kerri, Kate and the boys and we put together a pretty epic charcuterie platter to go along with champs but I think my favorite thing I made this weekend were these flourless chocolate peanut butter cookies. If you've been following along with me for awhile you've probably heard me complain about my stomach issues more than a few times and you probably know I just finished the Whole30 last week. I definitely noticed a change in my body while on the Whole30 and I will definitely be trying to incorporate some of the eating habits I picked up from it into my every day life. One of those is eating as little gluten as possible. I'm not usually a huge sweets person but I am a sucker for chocolate and peanut butter and brownies. On Sunday I had a huge urge for something with chocolate and peanut butter but I wanted to avoid something that would make me feel sluggish later. 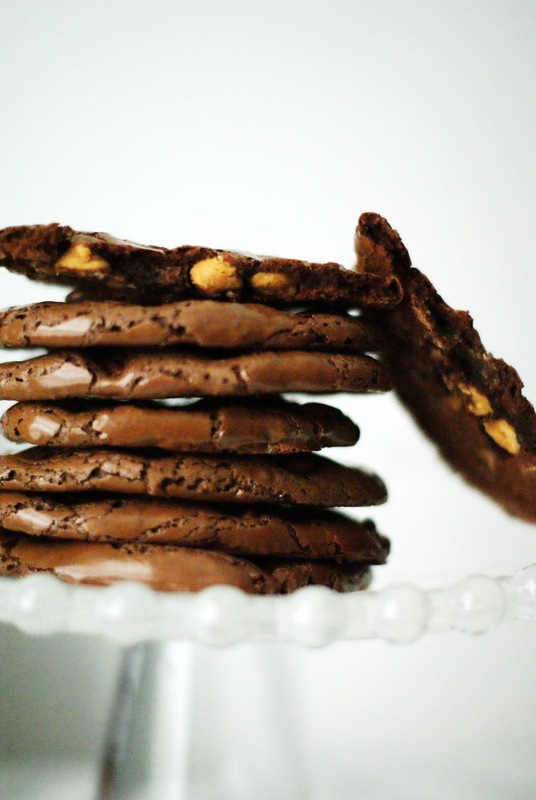 Enter these flourless chocolate peanut butter cookies! At only 68 calories each and with no flour, these cookies were the perfect sweet treat without making me feel bad. Since these are flourless they don't get as thick and chewy as regular cookies do, in fact they're actually really crispy on the edges and then have a fudgy like center that reminds me of the outside edges of brownies. Scoop the batter by the tablespoonful onto the baking sheets. I lined my baking sheets with parchment paper, spraying them with non-stick spray can make the cookies run. My husband loves these cookies! I always add walnuts, but I need to try these pb chips next time. I bet that is awesome! These sounds great!! There are so many friends of mine who have tummy issues so this would be the perfect recipe for some of our upcoming parties! Oh wow! These sound and look divine. And I love a crispy cookie! 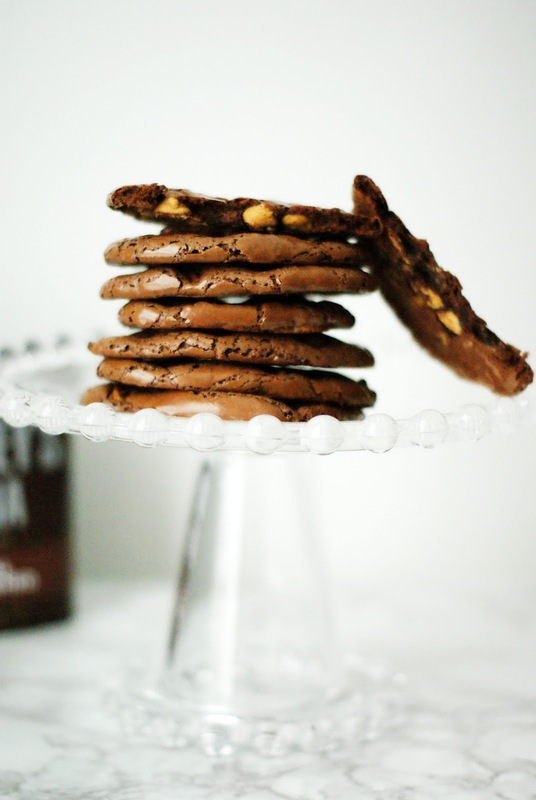 These look seriously incredible and has me craving some cookies now :)! I actually prefer the crispier edges over the thicker cookies so will have to try these out! Those look so good! I would love to hear your full review of Whole 30, I've been wanting to try it forever! I'm totally on the same page as you! After the Whole 30 I went totally off the rails and ate a bunch of carbs/gluten and felt like CRAP after! Definitely trying out this recipe--they sound so yummy! um these look heavenly! you know chocolate peanut butter is my fav combo. i def will have to try these. also had a blast on saturday! YUM! These are so yummy looking and I definitely have to try them! I love a good, easyt o make gluten free recipe! Also, can we discuss how amazing your photography is??? My mom is gluten-free so I always love finding recipes she can try out and these look delicious! Love how quick and easy they are too! I have to try these very soon! Anything chocolate and peanut butter is always my favorite! Oh my goodness, do these sound good! Peanut butter is my weakness and I was just saying I wanted to make a sweet treat. I might give these a try next weekend -- love the quick bake time! Yumm this looks so good! I am definitely trying these out! Peanut butter and chocolate is my all time favorite combination! These sound great. I did whole 30 once and really enjoyed it. We also still use many of the recipes and habits. These look delicious!! Definitely saving to make sometime soon! Totally pinning this! I'm a sucker for anything with chocolate! I'm trying to be better so I'm sure these will help when I crave sweets! Yum! I will be making these, they look and sound so delish! these look super yummy and only 68 calories, yay! Oh my word, my mouth is watering. These sound amazing! Ok now my sweet tooth is yelling at me for some cookies! These look delicious... Totally saving this recipe! Ooooh yum! These look so good and I love that they are flour-less! Girl you are speaking my language! These look amazing! These look so good and I'm a fan that they're flour-less even though I haven't ever tried a cookie like it. I have stomach issues too so that would solve that problem and sometimes you want a slightly guilt-free treat to indulge in. These sound awesome! I've been having stomach issues, too - I think it's dairy but I've cut out most of it. May try gluten next! And I love your nail color. Hope you're starting to feel better! Yum, these look so good! hope you're feeling a little better! 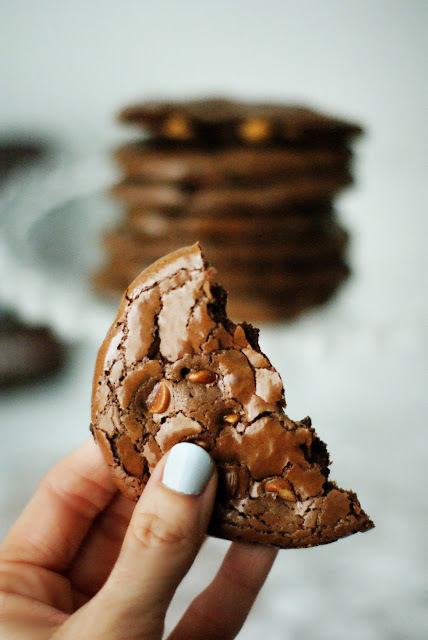 These cookies look extremely delicious girl, I love the recipe and should make it this weekend! gosh I need this right now! Yum! I keep thinking about doing another W30 - I really do feel so great after. These seriously look SO good. And 68 calories?! Totally doable!